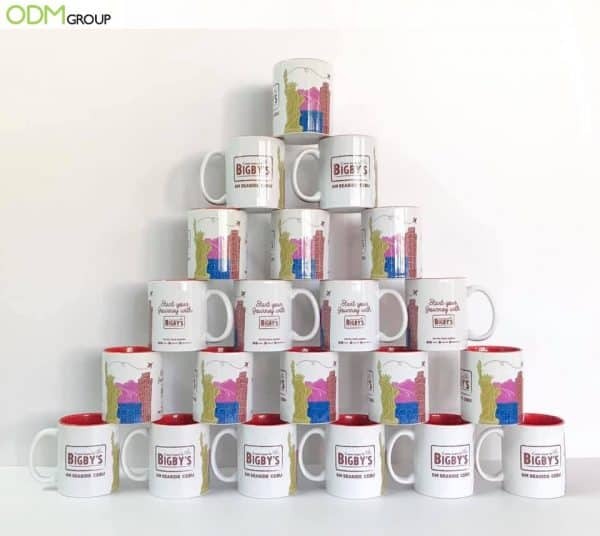 Customised mugs are the go-to promotional giveaways for most brands. It may sound cliche but mugs offer a lot of branding potential as it is a versatile promotional product. Materials can vary : they can be made out of ceramics, glass, metal, and wood. Because they are practical, you can also be sure that your marketing gifts will be used by your target audience. We spotted these custom branded mugs at a coffee shop in the Philippines. The mugs are nicely branded with their logo, iconic landmarks, and a sweet short message. This product comes in a range of shades and patterns. It is important for customized drinkware to fit your brand’s visual identity and focus. This is one for marketing alcoholic drinks. Also, according to drink aficionados, copper mugs improve the taste of drinks due to the oxidisation which occurs when alcohol comes into contact with metal. Football shaped mugs are the perfect promo and cost-effective way to promote your brand during sports events. The custom shaped mugs add an exciting twist to your promotions. Brand Exposure – A promotional mug with your logo on all sides is an attractive way to promote your brand right after purchase. Ensure eye-catching designs and high-quality mugs so customers won’t be able to resist the urge to pick it up especially when bundled as a gift with purchase. Promotes Loyalty – When customers receive promo gifts from their regular purchases, this leaves a positive mark on the customers. These grateful customers will now list your brand as one of the brands that they should always check out. Sparks Interest – In relation to incredible designs, when a brand creates a marketing giveaway that offers a lot of creativity and intrigue, this sparks interesting conversation between customers. Since these mugs will serve as a conversation starter, this means a free and insightful advertisement for the brand. Overall, if you’re looking for a tested and reliable promotional idea, customised mugs are the way to go. These items are affordable and easy to produce. So, if you are interested to create your own customised mugs, feel free to contact The ODM Group today. Manufacturing ceramic mugs with custom designs could be an excellent solution to boosting your brand performance. We have listed a few of these attention-grabbing customized ceramic mugs that could be the star of your next marketing campaign. This corporate gift is ideal for office workers and travellers. When working in front of the PC, sitting all day in the cold or traveling to your next destination, these stainless steel travel mugs will get you covered. Lastly, are you still looking for a mug design inspiration, look no further as we have collated the most interesting designs for a ceramic mug.